Do you have the guts for skydiving? 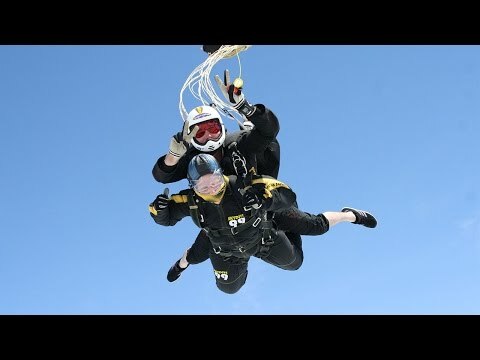 If you are afraid of this extreme sport, think about Stella Gillard, a 90-year-old lady who has recently tried skydiving from a height of 15,000 feet, and that too for charity. Yes, Stella Gillard from UK has proved that age is no bar when it comes to try something unique and extreme. Stella Gillard, the brave pensioner undertook the jump to raise money for cancer research and in memory of her daughter. Her daughter Kathy died of pancreatic cancer in 2012. Her feat has raised over 1,580 pounds for the charity. To be honest, I was not even a bit worried, not one bit. The instructor talked me through how it would go and I completely trusted him. The fall before the parachute opened was a little nerve-racking just because it was so fast, but as soon as the parachute opened, it was beautiful. Said, Stella Gillard. Stella Gillard has confessed it that she was not worried ahead of the jump, to raise money for cancer charity. We must salute the spirit and the determination of this 90-year-old lady; because what she has done, probably a youngster will think many a times before trying it. Both her spirit and the noble cause for which she has been raising money, make Stella Gillard a true inspiration for all of us.